A total of 20 records matched your search. 101 Christmas Sayings from Leisure Arts contains 101 patterns stitched on 18 count Antique White and fit into round frames with a 2 1/2" diameter opening using DMC or Anchor floss. 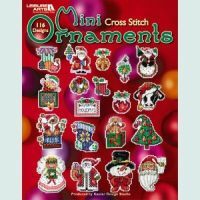 101 Ornaments for Christmas by Donna Kooler from Leisure Arts allows you to trim your Christmas Tree in cross stitch charm! 101 quick-and-easy ornaments with 9 finishing options available to you. 116 Mini Cross Stitch Ornaments contains ornaments to please all types of holiday spirit. Designs were created by Kooler Design Studio. Alphabets Galore from Leisure Arts contains 136 alphabets with a mixture of cross stitch and backstitch, large and small, some with flowers or figures, choose your fabric and use either DMC or Anchor floss. 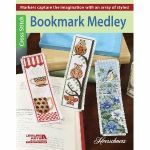 Bookmark Medley contains 14 cross stitch designs to mark your spot in your favorite book. All designs are stitched on 14 count. Make some for friends as gifts or yourself to put in your favorite book. Christmas Ornaments from Leisure Arts has 78 designs ranging from simple to complex using plastic canvas, perforated paper or fabric of your choice, DMC or Anchor floss. 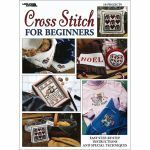 Cross Stitch for Beginners has 12 pages of instructions with 12 patterns for beginners ranging from 35w x 41h to 71w x 131h as well as an alphabet for stitching. Donna Kooler's Ultimate Stocking Collection contains 15 of Donna Kooler's favorite Christmas stocking patterns. Alphabets are included to personalize your finished stotcking. Fast and Festive-50 Christmas Designs with multiple options for finishing. Patterns use DMC floss and Kreinik Metallic threads. 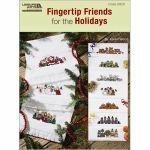 Fingertip Friends for the Holidays from Leisure Arts contains 10 patterns that fit Fingertip Towels with 14 count inserts. Designs range in size from 4 1/1"w x 2"h to 6 3/8"w x 1 3/4"h. DMC or Anchor floss. I Can't Believe I'm Cross Stitching from Leisure Arts has 8 patterns to start your stitching experience with pages of instructions and useful information. The patterns use DMC or Anchor floss. 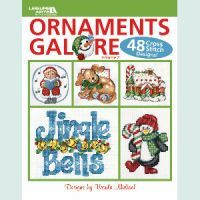 Ornaments Galore from Leisure Arts has 50 designs ranging from simple to complex using Perforated Paper or fabric of your choice, DMC or Anchor floss. 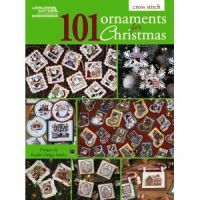 Ornaments Galore Volume 2 from Ursula Michaels contains 48 festive images to brighten your holidays. 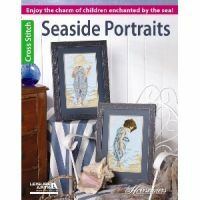 Seaside Portraits from Leisure Arts contains 2 designs, a young girl with stitch count of 91w x 153h and a little boy with a stitch count of 1w x 153h, both stitched on 16/32 count Ice Blue using DMC/Anchor floss. 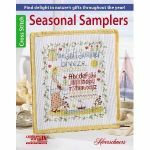 Seasonal Samplers from Leisure Arts contains a Sampler for each Season designed by Alma Lynme stitched on 14/28 count White fabric. 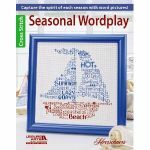 Seasonal Wordplay by Ursula Michael from Leisure Arts contains 4 designs stitched on 14/28 count White fabric with each season designed in words that bring those seasons to your mind. 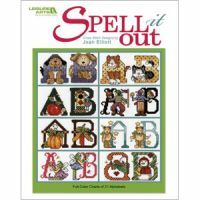 Spell it Out, cross stitch designs by Joan Elliot from Leisure Arts is filled with 49 pages of alphabets, graph paper and instructions. Teach Me To Stitch from Leisure Arts has 15 patterns for beginners ranging from 28w x 26h to 111w x 77h. This book has pages of instructions as to beginning to stitch, fabric, needles and how to read a pattern. 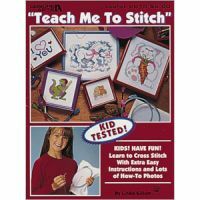 Great for the kids who want to learn how to stitch. 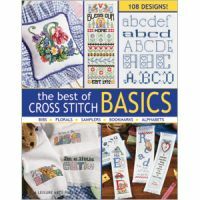 The Best of Cross Stitch Basics from Leisure Arts has 108 designs ranging from simple to complex using fabric of your choice, DMC or Anchor floss. 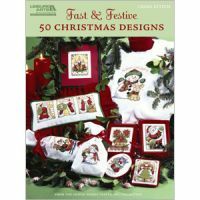 Ultimate Stocking Collection by Donna Kooler from Leisure Arts has 15 of Donna's favorite Cross Stitch Christmas stockings using fabric of your choice and DMC or Anchor floss. Alphabets are included to personalize your stocking.